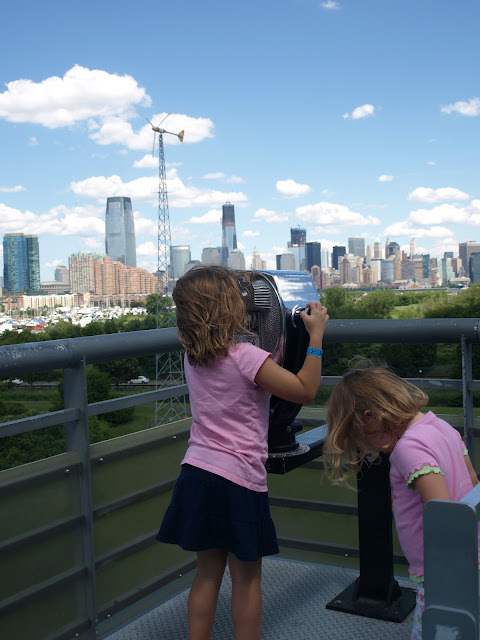 We were recently invited to visit the Liberty Science Center in Jersey City, NJ. 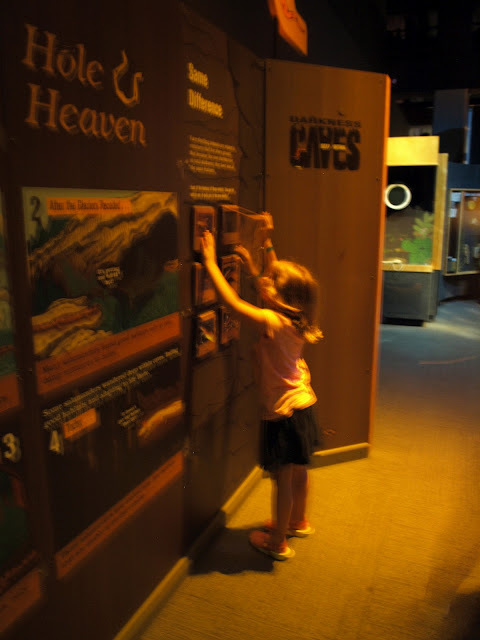 They have a lot of new exhibits set up for the summer... and we were ready to learn! I have to admit... I have lived in NJ my whole life, and I was never to the LSC before. Not even on a school field trip. I can't say there is a reason. I just hadn't ever been. So, the invitation to visit was as exciting for me as it was for the kids. Liberty Science Center (LSC.org) is a 300,000-square-foot learning center located in Liberty State Park on the Jersey City bank of the Hudson near the Statue of Liberty. Dedicated to bringing the excitement of science to people of all ages, Liberty Science Center houses seven museum exhibition halls, a 3D theater, the nation's largest IMAX Dome Theater, live simulcast surgeries, tornado and hurricane-force wind simulators, K-12 classrooms and labs, and teacher-development programs. 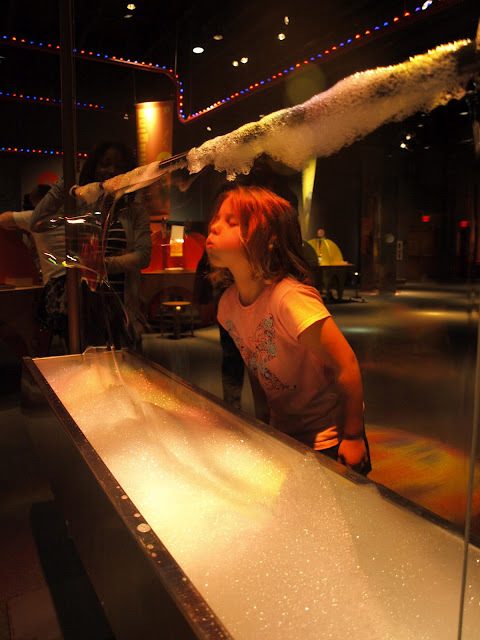 600,000 students, teachers, and parents visit the science center each year, and tens of thousands more benefit from the center's off-site and online programs. Our first stop was to the new "Got Power?" Exhibition and the Energy Quest. The kids loved the experiments (although Zoe got a lot more out of everything since she could read the little signs). 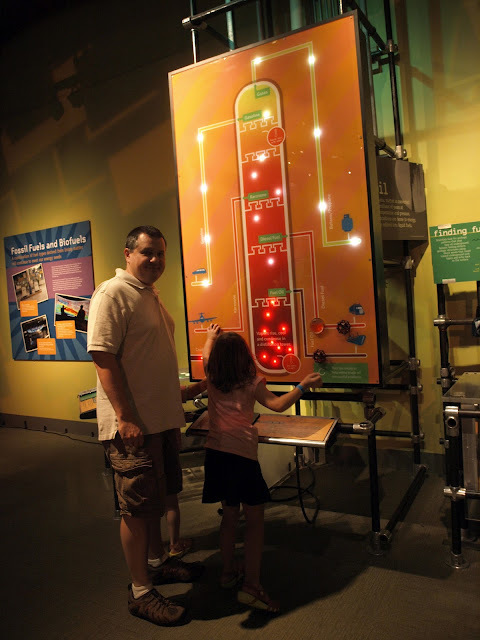 And, since Nick is an engineer (and works with heaters and refineries) I think he was pretty interested in the exhibits too. I have to admit... one of my favorite things during the day was stepping outside on the observation deck. The "In the Dark"exhibition is also new this summer. It was hard to get any photos since the whole room is (like it says) IN THE DARK. Ana was a little panicked at the dark. Zoe was a little more excited. It was amazing how much there was to learn about the different things that go on at night and in darkened caves and grounds. The "In the Dark" exhibition also has a lot of special "Glowing Summer Activities". We were short of time... but we did get to go to the "Animals After Dark: A Flashlight Adventure!" The other activities sound really fun though (and we might need to get back for another visit soon!). I'd be really interested in the "Crazy Glowing Bubbles" and "Detective-in-the-Dark". 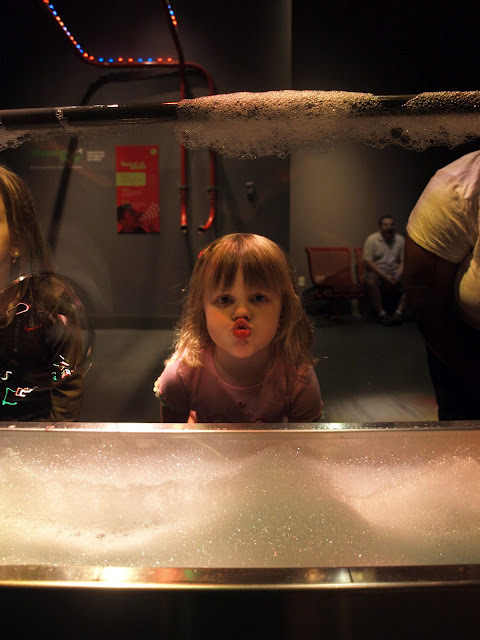 I think the girls favorite exhibit was "Wonder Why".... specifically the 6 foot bubble blower. We could have blown bubbles all day. But... other people were dying for a turn. "Wonder Why" also had a rock wall to scale across. I was pretty impressed with Zoe. The girls had such a great time at the Liberty Science Center. I love when places are educational while being fun. The kids learn things without even realizing! We'll definitely be trying to squeeze another visit in this summer. 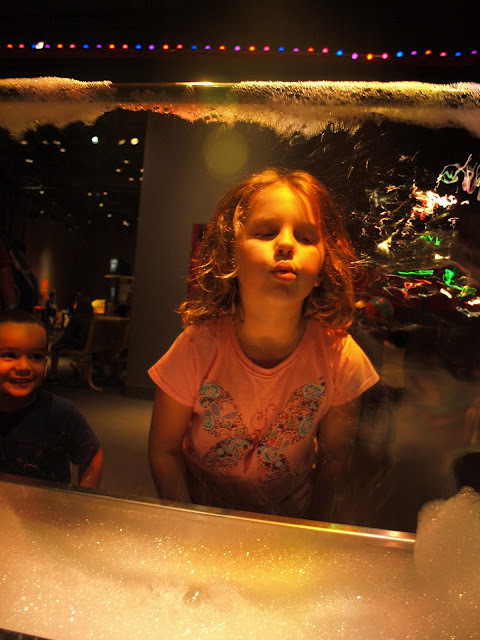 Disclosure: I was sent 4 complimentary passes so I could go with my family to visit the Liberty Science Center and check out the new exhibits... and 2 passes to give away to my readers. All of the opinions expressed are my own.